The technology inside that new solid state drive you just purchased could be obsolete sooner than you think. A group of Japanese researchers have developed a hybrid SSD that uses high-capacity NAND flash memory alongside Resistive Random Access Memory, or ReRAM. The combination could allow future drives to write up to eleven times faster than today’s quickest SSDs. The research was led by Professor Ken Takeuchi from Chuo University and presented at the 2012 Symposium of VLSI Circuits held in Hawaii. At the event, the group proposed a drive that included 256GB of NAND flash as well as 8 Gbits of ReRAM, the latter of which is used as cache and storage. In addition to the increased speeds, researchers claim the hybrid drive will reduce power consumption by up to 93 percent. And if that isn’t enough to get you excited, these drives could last far longer than traditional SSDs – nearly seven times longer, to be exact. ReRAM, however, is currently expensive but the price versus longevity factor could reduce overall costs to just 1/7 of today’s drives. Life of the drive is also extended by reducing the number of writes in the NAND flash. 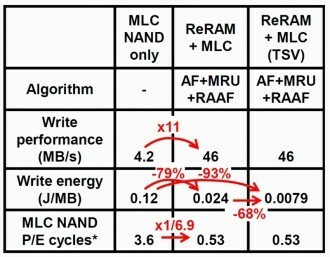 Instead, data is written in the ReRAM about 30 times more often than in NAND flash. An algorithm called MRU (most recently used) is used to store frequently used data in the ReRAM. By using this method, common data can be read from the drive faster than from NAND flash. Despite its promise, Neowin concludes that we aren’t likely to see this technology come to consumer-level SSDs anytime soon. The reason for this has to do with the price of ReRAM. If the researchers can significantly lower the overall price (none was mentioned) then things could become much more feasible.